It’s 2500 years ago, the time when Greek traders traveled to southern Italy to settle and develop the area. You, as a Greek trader, are intimately involved as you seek to colonize, develop markets and capture the attention of the oracles. 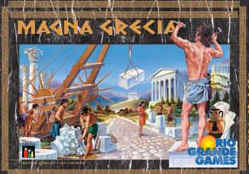 This is the world of Magna Grecia, the combined effort of Michael Schacht, best known for Web of Power (Summer 2000 GA REPORT) and Leo Colovini, creator of many designs including Cartagena (Winter 2001 GA REPORT). The game comes with 80 each of road tiles, city tiles and markets (divided into the four player colors), 9 oracles, 12 action cards, and a mounted game board showing the undeveloped land and villages. Each player begins with his own set of tiles and markets and a summary card used to hold 4 road and 4 city tiles. Remaining tiles remain aside to be used later. The 12 action cards are separated into four piles (based on their border color). They are shuffled individually and then, randomly, one card from each stack is drawn to make a new stack. This is done two more times so that all 12 cards are now in the new stack. This new stack is turned, FACE UP, next to the board. The 9 oracles are randomly placed on any 9 villages. With scoring markers placed at 15 on the scoring track (less with few players than 4), the game begins. Each action card shows the colors of the players and turns are taken in the displayed order. Three basic actions are possible each turn and players may only take TWO of them. They may build roads (by placing on the board up to as many building road tiles as shown on the action card), found or expand cities (by placing city tiles up to as many as are shown on the action card) or resupply (by adding up to the number of road and/or city tiles displayed on the action card to their holdings). A player may also choose instead to do an “enhanced” action which means he only chooses ONE action for his turn but at a higher value (as shown on the action card). Players extend their “empires” by starting from the edge of the board and moving inward. Road placement resembles laying track in a railroad game although there’s more here than that. Roads connect cities and villages and may be placed adjacent to ANY player’s city, adjacent to an oracle or a village (provided that player’s road is linked to that oracle or village) and, of course, to another of his own roads. Road placement is free. City tiles are placed on a village with a green border (along the perimeter of the board) or on a village space without a green border connected by that player’s road. Cities may also be expanded by placing additional city tiles alongside a player’s already established city. Players may only found 1 city per turn although already existing cities may be expanded without limit. It costs 1 point for each city tile placed. As points are spent to build and expand cities or create new markets, players’ scoring markers go down. Something to keep in mind: you do NOT get more points during the game unless you sell one of your markets. Build recklessly and you could find yourself cannibalizing your holdings and in a much weakened position. The value of a market in a city or village is equal to the number of places DIRECTLY connected to it. The colors of the roads making the connections are irrelevant! So, a market connected to two villages, two cities and an oracle, for example, is worth a hefty 5 points at game’s end. Which brings us to the oracles. Oracles “pay attention” to the cities with the most connections. When a road connecting a city to an oracle is built, the oracle is turned so it points to that city. Should another city, with more connections, later link to the oracle, the oracle shifts direction and points to the other city. At the end of the game, a player scores a substantial 4 points for each oracle pointing to one of this cities. When the final action card is completed, points are tallied. The four points for each oracle pointing to a player’s city are added to each player’s market values based on connections. The player amassing the highest total wins. Rules provide for 2 to 4 players and allow for an 8 or 12 turn game. The game works best with the full complement of 4 players and, although the game works either way, the full 12 turns is recommended as it provides for more interaction leading to an exciting and tense endgame. In the European version, the graphics of the board (a bright yellow) were sharply criticized. You can put your sunglasses away. The Rio Grande edition has muted the glare. However, as the color motif of the game is supposed to be red, brown, orange and yellow but is actually light red, dark brown, light brown and lighter brown, the pieces can tend to blend. Watch out for that.